iPhone SE - A big step for small. 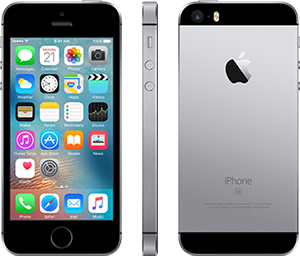 iPhone SE features a 4-inch Retina display, an A9 chip with 64-bit desktop-class architecture, the Touch ID fingerprint sensor, a 12MP iSight camera, a FaceTime HD camera with Retina Flash, Live Photos, LTE¹ and fast Wi-Fi, iOS 9, and iCloud. ¹Data plan required. LTE Advanced and LTE are available in select markets and through select carriers. Speeds are based on theoretical through-put and vary based on site conditions and carrier. For details on LTE support, contact your carrier and see www.apple.com/iphone/LTE. This Phone works with all SIMPLE Mobile 30-Day Service Plans. No Contract, No Credit Checks. Plans are not returnable or refundable. Service Plan card is required for activation. iPhone purchases are limited to a maximum of 2 per order. 12-megapixel iSight camera with 1.22µm pixel size. Browse the web, download apps and games, and stream video over 802.11ac Wi-Fi and LTE - with speeds even faster than on iPhone 5s. The world's most advanced mobile operating system gets major enhancements to built-in apps, a smarter Siri and search, and much more.